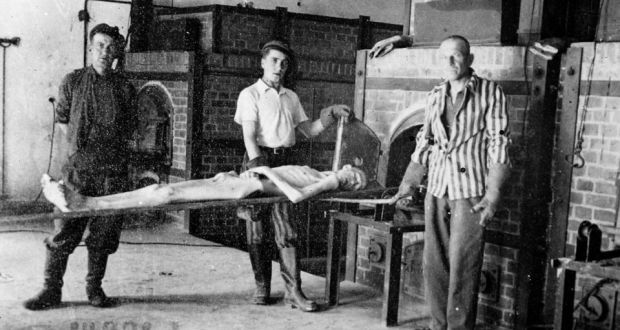 do they weaken the taboo against anti-Semitism? Jewish TV & filmmakers may have the right to exceed taboos - but should they, and should they be rewarded for it glamorizing it? Do Jewish shock-comics legitimizing dark-humor help or hurt our crusade to quell anti-Semitism? At times haphazard but always involving, "The Last Laugh" confronts a question that sounds anachronistic in today's anything-goes world: Are there any taboos remaining in humor, areas where making jokes is simply beyond the pale? Though documentarian Ferne Pearlstein (who photographed and edited as well as directed) deals briefly with potentially forbidden areas like 9/11 and even child molestation (the subject of a Louis CK routine), most of the film focuses on jokes about Hitler and the Holocaust, a subject that elicits as many opinions — and jokes — as there are interview subjects. Those speaking up include Larry Charles — involved in everything from "Seinfeld" to the features of Sacha Baron Cohen — and Israeli novelist Etgar Keret, the son a Holocaust survivor, who notes that "humor is the weapon of the weak." One of the most involving voices in the film turns out to be Mel Brooks, whose vision of "Hitler on Ice" from "History of the World, Part I" opens the film. ... he (Brooks) also has some thoughtful things to say about why he can do Hitler jokes but not ones about the Holocaust. Rob Reiner agrees. 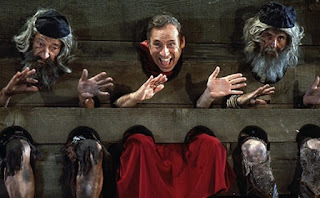 Mel Brooks as Torquemada sings "The Spanish Inquisition"
Mel Brooks broke the public taboo on joking about Jew-hatred, showing gallow-locked Jews singing in "The Spanish Inquisition" musical number in his "History of the World Part 1," and creating empathy for Franz Kiebkind and his other singing and dancing Nazi characters in The Producers' "Springtime for Hitler." But do comedians' making light of anti-Semitic atrocities diminish the taboo against Jew-hatred to the gentile public? Do they weaken the societal taboo deterrent against Jew-hatred? Is anyone who behaves tyrannically now a "Hitler?" Does the "Soup Nazi" reflect a now mundane adjective- and diminish Nazi-ism and its victims? The Last Laugh claims to explore the issue, but as a public-figure objecting to comics' (even Jewish ones) making Nazi & Holocaust fun shows only Rabbi Abraham Foxman, former Anti-Defamation League executive director. The film posits Sarah Silverman as an authority on justifying Jewish comedians mocking Jews and Jewish subjects. Silverman, Jon Stewart, and comics like Amy Schumer have popularized "Jewy" as an acceptable disparaging adjective. Being perceived as Jewy is now an acceptable anti-Semitic criticism, without equal in, for example, African-American identity. L.A. Jewish Film Festival's screening in Beverly Hills this weekend featured Renee Firestone, one of just a few concentration-camp survivors commenting in the movie (Hogan's Heroes' Cpl. LeBeau-actor, Robert Clary being another), claiming that having survived to approaching 93-years of age in the midst of the Allies defeat of the Axis powers shows that she (and thereby, we) has "the last laugh." But Jew-hatred (demonstrated online) is strong throughout the world and Jews deluding we already have the last-laugh are avoiding our need to still fight it, socially, politically, and physically- and through other means than the liberally politicized A.D.L. We spoke with the filmmakers after the post-screening discussion. "The Last Laugh" is an intellectual exploration in whether Jewish comedians go too far. But it reflects the weakening taboo (and deterrence) against anti-Semitic attitudes, statements, and conduct which may grow among the gentile public who may see it on TV. Los Angeles- at Laemmle Theatres Town Center 5 Encino and Music Hall Beverly Hills through March 23rd.